The police have today issued a new video to help British Sign Language users. The video shows how victims can report hate crime to the police online and includes an option to report anonymously, where the victim is unwilling to share their details with the police. The video has been produced in partnership with the University of Wolverhampton, West Mercia Police and the Telford Deaf Club. 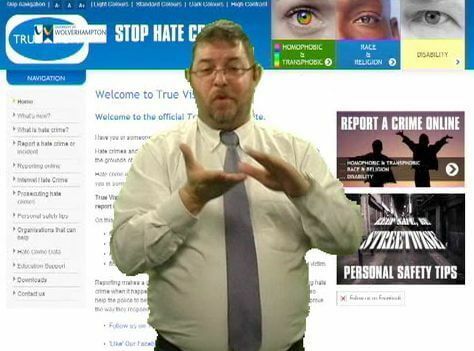 It shows people how they can use the True Vision police hate crime site to report hate crime. Disability hate crime is a priority for police and increasing reporting is a key challenge of the Government Hate Crime Action Plan published in March 2012. "This is a fantastic example of the police working with community groups and a local university to provide resources for people who fear hate crime. We are determined to reduce the harm caused by hate crime, but we know they are vastly under-reported and initiatives like this are vital to raise awareness and to encourage reporting when crimes do occur. The packed meeting room shows how important this is to the local community and this valuable resource can now be shared nationally. I am extremely grateful for the inovation and commitment of an effective local partnership."